Europe’s oldest university town, light-hearted, vivacious Bologna is perhaps the most exciting city in Italy. 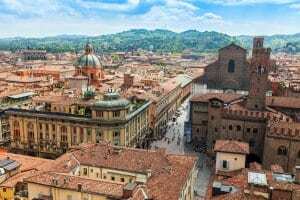 Although lacking in some of the opulent art and museums seen elsewhere in Italy, Bologna offers a different kind of charm, one created by a bohemian attitude that’s clearly visible in the cafés and trattorie that dot the streets and plazas of the center city. The large and exceptionally well-preserved Centro Storico (historic center) is pedestrian friendly and perfect for strolling. Considered one of the largest intact historic centers in all Europe, it’s a potpourri of Medieval, Renaissance, Baroque and modern architecture. At the heart of the center are the bustling Piazza Maggiore and Piazza del Nettuno (where the 16th-century Fountain of Neptune stands), two adjoining plazas rimmed with cafés and beautiful buildings like the Palazzo Comunale, now the town hall. Inside, a monumental staircase designed by Bramante to allow horse-drawn carriages upstairs is the first thing you will notice. The building is also home to a small art collection and to a museum focusing on the work of artist Giorgio Morandi. Nearby sits one of the city’s most unique churches, the Basilica di San Petronio. The fifth-largest basilica in the world, this mammoth Gothic church is unfinished but still beautiful. To get a stellar view over the old city, head to the Torre Asinelli, one of two leaning towers in the Piazza di Porta Ravegnana. At 97 meters, it affords a wonderful panorama of Bologna’s rooftops and church spires. Like so many Italian cities, Bologna was first founded by the Etruscans in 500BC (who called it Felsina), although its name actually dates to a Gallic tribe called the Boii, who conquered the settlement a few short hundred years later. Eventually, the Romans also appeared, bestowing it with the name Bononia in 189BC. Today you can see the remnants of the Roman period under the old stock exchange (Sala Borsa) and of course at the Museo Archeologico. An important Roman center for centuries, it eventually declined and in 728 became part of the Lombard Kingdom. Its university was founded during this time; created in 1088, it’s famed as one of the oldest in the world. Dante was a student here. Always a progressive place, Bologna was ahead of its time when in 1256 it freed all slaves and abolished serfdom. Bologna has always been a hotly contested city. The Church, various emperors, and aristocratic families have long fought over it. The university has traditionally brought the city revenue and trade flourished under the guilds brought (in the Mercato di Mezzo area the streets are named after the guilds and workshops located there for centuries). Napoleon’s army arrived in 1796 and swiftly took over the city and its possessions. Upon his departure, Bologna became part of the Papal State, until being incorporated into Italy with the unification. Through scores of civil wars and scuffles for hundreds of years, Bologna remained one of Europe’s most influential cities. 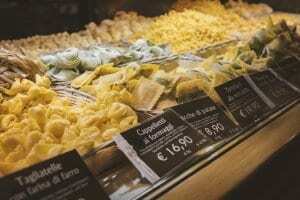 It’s still one of Italy’s economic engines and is an important transportation and trade hub. Bologna was a European Capital of Culture in the year 2000. Bologna has many nicknames, the most famous being “La Grassa” (the fat one, a reference to the varied culinary temptations), “La Rossa” (the red, referring to Bologna’s fame for being communist and far left, and also a reference to the city’s dominant terracotta color) and “La Dotta” (the learned one, a reference to Bologna’s historic university). The famous author Umberto Eco (The Name of the Rose) was a professor at the University of Bologna! John Grisham, another best-selling author, recently set his book “The Broker” in Bologna. Above all the thing that strikes the lucky visitor to Bologna, apart from its fabulous food and wonderful cultural heritage, is the general joie de vivre of its inhabitants. Without a doubt, Bologna is one of Italy’s most pleasurable and fun cities. Surrounded by gourmet meccas like Parma (where Parmigiano Reggiano, Prosciutto di Parma, and the exquisite Culatello ham is made) and Modena (home to Italy’s authentic Balsamic Vinegar), Bologna offers gourmands an enviable variety of Italian specialties. As one of the country’s pasta centers, both dried and fresh pasta are in abundance; you can’t go wrong with regional specialties like tortellini in brodo (in broth, stuffed with prosciutto, mortadella or parmigiano), tortelloni (stuffed with ricotta) and tagliatelle al ragù. The ragù is so famous, that what we call “Bolognese” means “sauce from Bologna). Lasagna is also famous here but served in a green spinach sauce. Other excellent local produce includes strawberries and cherries, here considered some of Italy’s best. You’re similarly spoiled for choice when it comes to wine. Bologna is in the heart of Emilia-Romagna, an area famed for white varieties like Albana, Malvasia, and Trebbiano, and for reds like Sangiovese, Barbera and Cabernet Sauvignon. Just outside Bologna, wine routes twist and turn through the countryside, leading to the area’s best winemaking centers. Wines to look out for include the popular and easy Lambrusco wines (sparkling red wines), Albana Passito, Sangiovese di Romagna and Cabernets of the Colli. You can taste Bologna’s local wines while having an aperitif at one of the town’s many outdoor cafes along the alleyways of the Mercato di Mezzo or at one of the many charming “osterias”. The epicenter of the centro storico, here you will find the imposing Fountain of Neptune and the Palazzo Comunale (Town Hall), home to a small museum dedicated to Giorgio Morandi. Beautiful squares, both of them. Nowadays the town hall, this palace is where Charles V (I in Spain), was crowned Holy Roman Emperor by Pope Clemente VII. He was the last Emperor to receive a papal coronation. This is a lovely place to visit. The world’s fifth-largest basilica, the towering San Petronio encloses a mammoth sundial dating to the 17th century. The Gothic façade is still unfinished. Who needs Pisa when Bologna boasts two leaning towers? The tallest at 97 meters, the Torre Asinelli was built in the early 12th century and has 498 steps you can climb to enjoy a fabulous view of the city. Home to the tomb of the founder of the Dominican Order, San Domenico, this is one of the city’s more interesting churches. The sarcophagus sits in a small chapel where a barrage of artwork and sculpture (including some by Michelangelo) stands watch over the saint. Bologna retains a medieval Jewish ghetto, and you can still see the narrow passageways, alleys, and courtyards where the Church confined Bologna’s Jews in the 16th century. Located between Via dell’Inferno and its adjacent streets, there used to be two actual gates enclosing the area. The Via dell’Inferno is also where the synagogue was located. The Jewish Museum (Museo Ebraico) is fascinating and exhibits the history of the Jewish community in Emilia Romagna (Ferrara is another town that had a strong Jewish tradition). For Ducati motorcycle lovers, this museum traces the history of the Ducati family. You can see antique motorcycles, old ads and more. This medieval college founded in 1365 to house the Spanish students enrolled in the university, is off the trodden path. Visits are by appointment only and if you can get in you will see a beautiful structure that resembles a monastery with a cloister and frescoed Loggia. An interesting anecdote is that thanks to tradition, the college still houses 16 (quite lucky) Spanish students enrolled at the University of Bologna for free!